Daniel Cormier, who currently owns the UFC light heavyweight and heavyweight titles, has been planning to retire in March of 2019 for some time. UFC President Dana White, however, isn’t sure that’s the way things will shake out. 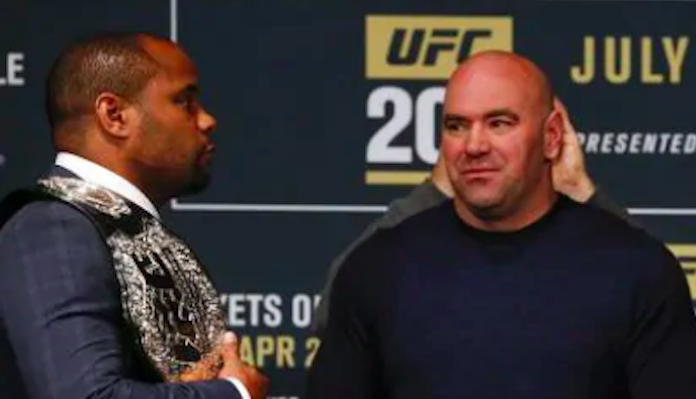 Dana White added that he is hoping Daniel Cormier will bump back his retirement plans to accommodate one fight in particular: a blockbuster trilogy fight with his arch rival Jon Jones — at heavyweight. In fact, the UFC boss wants three more fights out of the reigning heavyweight and light heavyweight champ. These comments from Dana White represent a bit of a u-turn, as he recently assured he would never encourage a fighter to delay their retirement plans. Daniel Cormier has expressed interest in fighting both Jon Jones and Brock Lesnar before his planned retirement in March, but has so far been adamant that we won’t be delaying his retirement for either. Do you think he’ll retire in early 2019 as planned?